Town houses belonging to roman patricians were designed to accommodate guests and clients in very different ways. Inward looking and closed to the outside world, the townhouses of the Roman elite carefully manipulated social space to accommodate private family life whilst making statements that reinforced the relative social positions of the owner and his visitors. The Reception Areas: The Fauces and Atrium. Externally, Roman townhouses were often unprepossessing and featureless. External walls contained few windows, restricting entry and maintaining privacy. It was common for even patrician residences to be fronted by shops. The only discernable external feature would have been the entrance of the house leading to the fauces. A narrow, dark passageway, the fauces was the public entrance to the domus. It was manned constantly by a porter who would monitor and restrict who could enter. Fauces generally led into only one room: the atrium. Originally, the atrium was the central communal room of the house. In early roman houses, it was here that the family would have cooked, worked and eaten. Water was collected via a hole in the roof- the conpluvium- into a central pool, the impluvium. The conpluvium also acted as a source of air and natural daylight. Although the atrium always maintained these traditional features, as well as housing the household shrine of the lares and penates, its function gradually changed. It developed into a central reception area, a nexus point where callers to the house could be directed according to status. For this reason, it was maintained as a feature only in elite households. The atrium was surrounded by dining areas, general reception rooms known as oeci and open sitting roooms called alae . Traditionally, small cubicula or bedrooms were situated around the atrium. With the development of the Roman house over time, these bedrooms moved away from the atrium to the private zones of the house. The Role of Mosaics and Frescos. Access to the public and private zones of the Roman domus was restricted by either closing off private areas physically or employing recognisable visual language in the form of decor. Private areas for guests or family were marked by ornately frescoed and paved passage ways which would immediately be recognised as no go areas by visiting clients. Ancillary rooms were peripheral and accessible via plain, unadorned corridors. The tablinium or study was entirely open to the atrium. Directly opposite the fauces, it was visually and physically accessible to even the most casual visitor. The Garden of the Roman Domus. 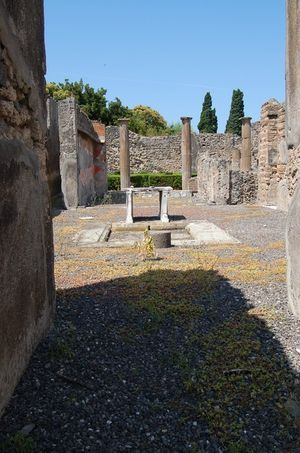 In very early style houses, a garden or hortus marked the limits of the house, as in the case of House of the Surgeon, Pompeii. However, in later style houses, the hortus developed into a peristyle garden. The peristyle was an internal feature, surrounded and overlooked by other rooms of the house. It played its role in transmitting messages of status to visitors. Often visible from the atrium, the peristyle garden acted as a full stop at the end of a sequence of rooms that made an important statement about the owner’s status to his clients: the fauces-atrium-tablinium axis. Patrician houses were not simply living spaces. They were an interface between public and private life. The house was the primary place of business. Every morning, during a custom known as the salutatio, the Roman pater familias would receive dependant clients and petitioners not at an office but in the tablinium of his house. The house was designed to channel these clients straight into the areas designated for public business whilst ensuring the private areas of the house remained private. In atrium centred houses, this involved employing the fauces-atrium-tablinium axis. The linear design of the architecture ensured that the first sight clients would see was their patron in his study. This was a convenient arrangement to ensure that the business area of the house was clearly demarcated. It also served to emphasis the subservient status of client. The higher the status of the house, the more reception rooms it possessed. These rooms were used in a private capacity for the entertainment of guests. They were also used to make statements of social status, employing visual language the visitors were familiar with. The dining room often faced onto the peristyle garden and it was common practice to frame the view using emblems from public architecture. By marrying impressive garden features with grand architectural images commonly associated with power in the public sphere, the owner could emphasis his own importance. This device is used to good effect in the House of Menander in Pompeii. Often those new to the roman elite had the money but not the subtlety to apply such visual devices tastefully. Misemployment could have the opposite effect to that intended. Such is the case at the House of Octavius Quartio, in Pompeii where overuse of this visual language creating a confused and vulgar impression. Wallace-Hadrill, A, (1988). ‘The Social Structure of the Roman House' in ‘Papers of the British School at Rome’. Wallace Hadrill, A, (1994) Houses and Society in Pompeii and Herculaneum. Princeton University Press.